I’m really going to start showing my age here but when I was younger, trips to the beach involved beach towels, a Frisbee and a small cooler. Present day trips to the beach however seem to involve packing half my house and it’s for this reason that a beach cart has become a must have item. Exactly when we decided that pop up tents, sunbrellas, skimmers, body boards etcetera, etcetera were fundamental items that were absolutely needed to enjoy our day in the sun, I can’t really pinpoint however, as the years have rolled on it seems that the accumulation of such things has crept up on me. Looking around the beach, I can tell I’m not the only one this has happened to – it now resembles some kind of small city. The option to carry all your stuff to your patch of sand is of course always there but anyone with any experience of this can testify that the better, more practical solution is to get yourself a beach cart with big wheels. For starters, attempting to carry all your possessions through ever increasingly populated beaches is a logistical nightmare which will lead to you breaking your own personal record of saying sorry in a ten minute period when you inevitably clunk someone on their head with your swinging cooler. If the cooler doesn’t get you into trouble then your younger children just might. If you have your hands full with all your beach goodies then effectively keeping your eye on excitable youngsters is an almost impossibility. You won’t be there to stop them tripping over protruding legs or running into a tent, destroying it in the process and you certainly won’t be able to stop them from excitedly legging it to the sea before you get the chance to get them in their bathing suits. What I’m trying to get at is that when you experience the simplicity that a beach cart can offer you from car to sand, you will wonder why you had not thought of the option a long time ago. When you are transporting all your needs for the day ahead, basically gliding over the sand, you will soon come to realize what a hassle free experience it has been, and one which saves you time and lets you concentrate on better things other than hoping to avoid clanging into other beach users. 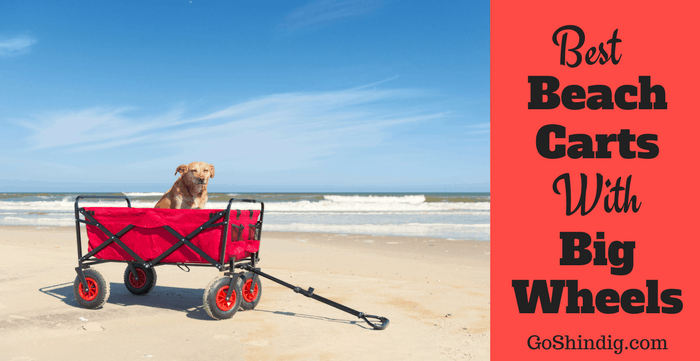 When deciding on which beach cart you might like to purchase there are a few things that you might want to take into consideration. As always, reading up on beach cart reviews can be a good starting point and will allow you to see problems other buyers have encountered and whether that is something that might affect your purchase. Perhaps there is a weight capacity that you think that you might exceed. In this case you might want to look at a beach caddy that has bigger wheels or a wider axle. On the other hand, space might be at a premium in the boot of your car, so you would have to think about a folding beach cart. There are a number of things that could persuade or dissuade you from your purchase, below I’ll offer a few suggestions and try to let you know about the good and the bad of each item. 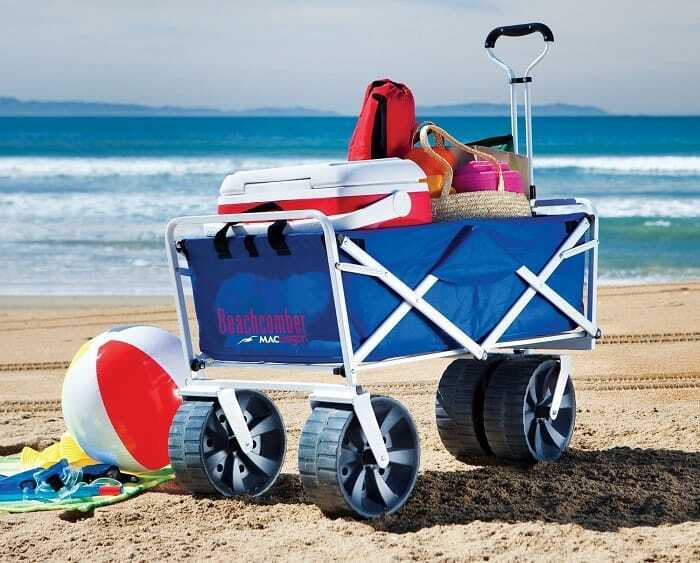 This foldable beach wagon by Mac Sports is an extremely popular option and one that you see many of down the beach. This is understandable as what this wagon offers is convenience and functionality. The convenience comes with its design – the two front wheels are both in the middle which means when it comes to packing it away, either in your car or garage, this folding beach cart will collapse all the way back and in between the two rear wheels. When all is said and done, this makes the size of the cart just under 10in. One of the biggest plusses for the Mac Sports beachcomber is that it is very easy to steer. Whilst some other beach carts might leave you almost dragging it through the sand if you want a change of direction, this one will handle steering effortlessly. The telescopic handle also makes it better than other similar beach wagons which require you to be about 4ft to pull them effectively. This wagon is possibly not for you if you are planning on bringing lots of heavy, odd shaped items with you. Umbrellas, chairs and big coolers are not ideal to load into what basically amounts to a basket. For lots of smaller items however this is one of the best beach carts you could get. This Rio beach cart is also one that you see plenty of down the beach. I like to call them stroller carts just for the way they resemble kid’s strollers. What I like about these styles of beach carts is that there is a place for almost everything that you might need to take for your day on the beach. There’s always a slot for your umbrella, conveniently running along the side of the frame, there’s huge capacity for all your smaller items and additional space is always allocated for your chairs. Added to this, with this particular design, you can either push or pull the cart which can be of huge benefit if you need to expertly navigate your way through the minefield of a crowded beach. 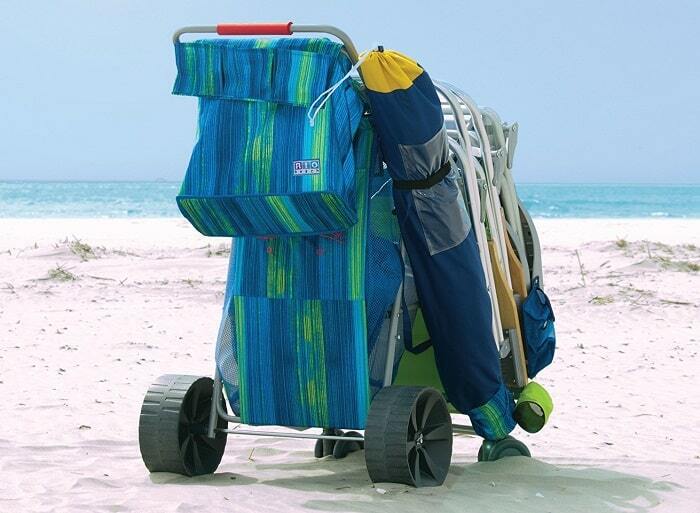 This particular foldable beach cart has a weight capacity of 100lbs and can carry a 48 quart cooler, 4 chairs, an umbrella and comes with a body board holder and a removable tote. Pretty impressive! The rear wheels are 4in thick making trips over soft sand all the more manageable. I’ve never been a fan of the big wheel, small wheel combo. I find that the smaller wheels tend to be susceptible to coming loose which makes the “ride” a lot less stable. Having said that, the primary way to use beach carts like these is to tip the whole weight onto the back wheels and let them take the load. If you want a cart that can possibly double up in more urban environments you might want to take this into account. When thinking of a beach cart with big wheels, the Challenger mobility folding beach cart is probably exactly what you were thinking of, only on PEDs. The standout feature on this beach cart is those massive wheels. They are proper tires with air in and everything. When looking at the Challenger beach cart you might think it’s wholly impractical. It looks like you need a truck, minimum to be able to transport it. This is not the case however as the wheels are detachable thanks to kotter pins, and the frame folds up so the last thing you need to worry about is space conservation. The large beach balloon tires enable you to pack heavy items onto the cart without any need to worry about getting stuck in the sand. As there is a lot more surface area than normal beach cart wheels, and the fact that they are inflated, it means that a smooth, floating experience is what you should come to expect. Whilst getting most things that you should need onto the Challenger beach cart, and others with similar design, should not be a problem, there may be times where you need to tie these things down. Generally you should be fine but at times it can prove to be a bit of a balancing act if you are transporting a lot of smaller, lighter items. Personally, I would use carts such as this one for chairs, coolers, body boards etcetera. Above, I have illustrated the 3 basic designs upon which all beach carts are made from – the wagon, the stroller and the dolly (these aren’t the official names) and I believe I have shown the best beach cart in each section when taking into account convenience, functionality, value for money and quality. Not everyone will agree with me and not everyone will think it’s an expense that they can justify. There are numerous DIY beach carts that the more thrifty and able handed amongst you can try your hand at. Pinterest is always a great place to look when trying to come up with ideas for DIY projects and below I have listed a few sites that I have come across that could possibly inspire you.